Thank you for your interest in employment with the Chittagong City Corporation Job Circular in Bangladesh. We sure that you will find the better information provided below. 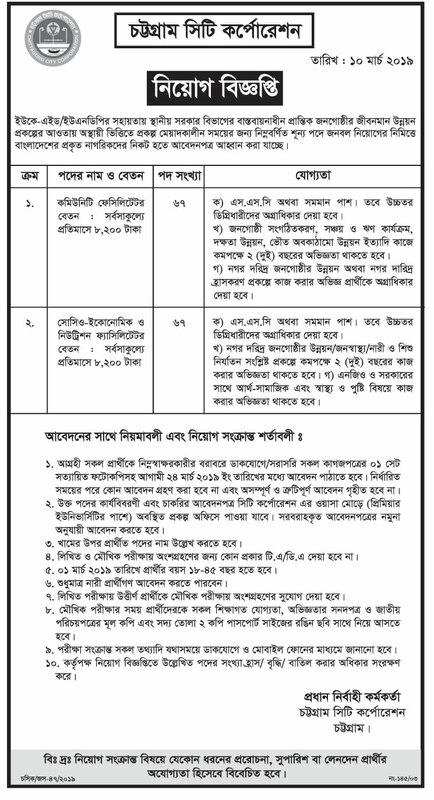 Chittagong City Corporation has circulated job circular in recent times.This is your chance to share your story and connect with job field in our country. As a hoping for a job, you’ll represent your skill and qualification. Please note that resumes/cv send only not direct interview or other communication. Chittagong City Corporation descended from the name of Chittagong Municipality which was founded on June 22, 1863. The initial area of newly formed Municipality was only 6 Sq. Miles. There were 5 wards viz A, B, C, D and E. Mr. J. D. Ward was first appointed administrator. Late Khan Bahadur Abdus Sattar was the first elected Chairman of Chittagong Municipality. Late Nur Ahmed was the most significant Chairman in the life of Municipality who introduced the important Education System under Municipal supervision. He governed the organization for 30 years. I need a job.Please help?